I am concerned about the smell of garlic. Although our recommendation is using garlic for cooking, we can reduce the amount or cut out garlic depending on your request. Can you serve an allergy friendly meal? We will do our best to respond to your requests. However, this type of request needs to be made in advance such as when you make a reservation. 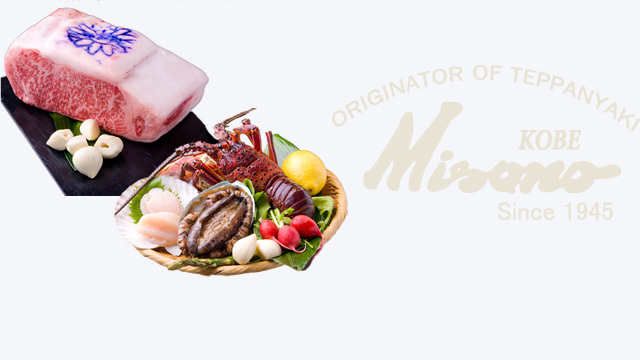 Is Kobe beef always available at all Misono stores? Yes. We prepare Kobe beef at all of our restaurants both for lunch and dinner. What are the condiments that I can use to my taste? We recommend the combinations of Natural salt from Akou & black pepper or homemade mustard & soy sauce. Can I chose different parts of meat other than the tenderloin and sirloin? No, you cannot. Misono does not serve other parts of meat than the tenderloin and sirloin. Can I specify or select the place of production of meat? No, you cannot. At Misono, there are two kinds of meat available: Kobe beef and Misono Best Quality Beef (Misono Premium Quality Wagyu & Misono Superior Quality Wagyu). Can I make a request on how I would like my steak? Yes. We take individual request on how you would like your steak. We usually recommend medium rare. No. We do not offer parking spaces. We suggest you to use nearby coin-operated parking spaces. Ikuta shrine parking space at Kobe store and a basement floor parking space at Shinjuku store are convenient. Can I take pictures at the restaurant? Yes. However, please take pictures only within your table not to interrupt other customers and also refrain from taking pictures of other tables and customers. We strictly do not allow our customers to take pictures by being on the chef's side of the counter or touching cooking tools because it may cause injuries. Yes. However, only Shinjuku store does not provide any Wi-Fi. Please be noted. Can I visit the restaurant with a wheelchair or baby stroller? Yes. You can enter the store without holding them. However, you cannot go inside the bathroom with a wheelchair or baby stroller. Can I smoke inside the restaurant? It depends on the restaurant. It is no-smoking at all seats at Osaka and Ginza stores. Are there any special charges other than the charge of food? Yes. There will be a table charge and 10% service fee after 5PM. Please check the web page of each store for more details. Is foreign language menu available? Yes. English, Chinese, and Korean menu is available. Yes. Credit cards such as American Express, Diners Club, VISA, MasterCard, JCB, UnionPay, and other cards are accepted. Please check the web page of each store for more details. What shall I do if I am running late for my reservation? Please call the restaurant and let our staff know your time of arrival. If you do not inform us and do not show up for 30 minutes after the reservation time, we will consider it as a cancelation and charge you a cancelation fee. Please call the restaurant as soon as possible to cancel the reservation. We do not accept the cancelation by email. Please be noted that there will be a cancelation fee for below cases. 1) When you do not show up for 30 minutes after the reservation time without contacting us in advance. 2) Cancelation for a big group of people. ・If the menu was once confirmed → 30% of the cost of the meal and 8% of the consumption tax will be charged. ・If the menu was not confirmed → 3,240yen (including tax) per person will be charged. What is the maximum size of group to visit? Kobe main store (35 ppl. ), Osaka store (35 ppl. ), Kyoto store (35 ppl. ), Shinjuku store (50 ppl. ), and Ginza store (35 ppl.). Please check the web page of each store for more details. Can I make a reservation for a big group? Yes. You can make a reservation for a big group if you can select the meal courses at the same time. Are there any menus or courses of meal that require reservations? Yes. We recommend to reserve seafood menu in advance because it may be sold out. Can I reserve the entire restaurant? Yes. Please reserve in advance. It depends on each restaurant. Only Ginza store has a completely separated private room. Although other stores do not have such a room, there are similar type of rooms. Please contact each store for more details. Can I make a reservation through the internet? No. Reservations through the internet or email are not available. What information should I provide when I make a reservation? Please tell below information to our staff. ※For the contact information, please let us know a number that we can reach during the day in Japan such as a mobile phone number. 1) Please directly call the restaurant that you would like to visit and make a reservation. 2) If you are staying at a hotel, please consult to the front desk. Is the reservation necessary? Can I make a reservation on the day of my visit? Yes. There are limited seats available and we recommend you to make a reservation. A reservation on the day of your visit is accepted.